Pakistan’s nominal per capita income rose 16.9 percent to $1,254 in 2010-11 from $1,073 in 2009-2010, according to the Economic Survey of Pakistan. Using the IMF's purchasing power parity exchange rate of Rs. 34 to a US dollar (versus official exchange rate of Rs. 85 to a US dollar), Pakistan's per capita income in terms of purchasing power parity works out to $3,135.00. Although Pakistan's per capita GDP rose by only 0.7% in real terms, the much higher 16.9% nominal per capita income increase reflects a combination of the nation's double-digit inflation rate and the the rupee's stable exchange rate with the US dollar which has been losing ground to most major world currencies in 2010-2011. Similar to Pakistan's nominal growth, at least a part of India's nominal growth in per capita gdp and income is also driven by rising domestic inflation of over 10% and appreciating Indian rupee (5.5% from 48.32 in 2009 to 45.65 in 2010) from strong hot money inflows from the Fed's quantitative easing in the United States and elsewhere. India's FDI has declined by a third from $34.6 billion in 2009 to $23.7 billion in 2010. Its current account deficit is being increasingly funded by significant short-term capital inflows (FII up 66% from $17.4 billion in 2009 to $29 billion in 2010) rather than more durable foreign direct investment (FDI). This alarming trend of declining FDI and surging FII in India has continued into 2010-2011. Looking at the increase in per capita income alone is quite misleading in judging the health of Pakistan's economy. Other indicators, such as real GDP growth and investments, show that the state of the economy is very poor. The nation's GDP grew only 2.4% in real terms in 2010-2011. Domestic investment dropped to a 40-year low of 13.4% of GDP, and foreign direct investment (FDI) declined by 29 percent to $1.232 billion during July-April 2010-11 from $1.725 million in the same period a year earlier. In addition to improved security environment, Pakistan has an urgent need for serious economic reform, greater social justice and better governance. Unless the PPP government acts to improve this situation, no amount of foreign aid, external loans and other help will suffice. The first step in the process is for the ruling elite to lead by example by paying their fair share of taxes and adopting less extravagant personal lifestyles to get Pakistan's fiscal house in order. Nominal GDP growing 16% and the real GDP grows just 0.7% is really a grave example of inflation and inefficiency. Thats like you spend more and get less. Nobody usually calculate GDP growth in terms of nominal GDP. Also, How correct is obtaining the real GDP just by multiplying the nominal GDP by 3 in this situation? Nominal-real ratio might have changed. Mohan: "Also, How correct is obtaining the real GDP just by multiplying the nominal GDP by 3 in this situation? Nominal-real ratio might have changed." The PPP conversion factor changes every year for both India and Pakistan as the inflation erodes the buying power of currencies in South Asia. I have used Rs 34 to a US dollar for Pakistan in 2011 to convert to PPP from nominal in my post. IMF PPP conversion estimates for India and Pakistan for 2010 are INR 18 and Pak Rs 34 to a US dollar in 2011. The Zardari government has inflated or cooked up some figures. GDP growth rate (not per capita) was 3.7% in 2009 and 1.2% in 2010 with GDP PPP per capita in 2008 at $2538! Actually, per capita growth has been stagnant since Mr. 10 per cent took office so it should be $2538. The Zardari government wants to fudge the numbers via the Economic Survey. Don't believe it. When we gone to India for cricket I paid 200 rupees to get 100 India rupees at Wagah border. 18 years last I paid 60 rupees to get 100 India rupee????? Sorry for english I am afghani but live in Pakistan in 1980. In 2010-11, inbound FDI into India fell by as much as 28%, the second consecutive year of decline and the first such large decline since the opening up of the economy in 1991-92. As a result of this decline, the present level of $27 billion of FDI inflows is the lowest in four years. A large part of the progress made in FDI inflows over the boom years has now been reversed, with flows down by almost 29% from their high in 2007-08. This trend, more than just being odd, is also worrying when seen in the context of the fact that the past four years cover the recessionary period as well. The decline in FDI in 2009-10 could be explained by the fact that it was a year when recessionary effects were visible in the global economy. All BRIC countries (Brazil, Russia, India and China) saw declines in FDI flows during that year. According to the United Nations Conference on Trade & Development (Unctad), flows into China fell by over 12% and to Russia and Brazil by as much as 49% and 42% from the previous year. However, a number of emerging markets have shown substantial recovery in 2010. The RBI pointed to Unctad figures to show that countries like China, Brazil, Mexico and Thailand had in 2010 shown a rebound in FDI of between 6-53 percent. Indonesia apparently showed a three-fold rise from the previous year. In India itself, FII flows have been on the rise over the past two years on an annual basis, with only 2008-09 being a year of sharp outflows. In fact, the outflow of $15 billion was more than made up by inflows of $29 billion — their highest ever — in 2009-10. This level was largely maintained in 2010-11 as well, with a small increase. Both these factors go on to show that the decline in FDI into India in 2010-11 is not the result of a weak global situation or investor risk-aversion. The causes really lie elsewhere. FDI flows showed a dismal performance in almost every month of the previous financial year, with May being the only exception. By the end of the third quarter, it became clear that FDI inflows would be nowhere close to what they were the year before. The RBI highlighted this in its quarterly ‘Macroeconomic and Monetary Developments (MMD) study released in January 2011 and suggested some reasons for the trend as well. The Ministry of Environment had recently questioned the ecological viability of the Korean steel giant, Posco’s proposed plans in Orissa, which could be one of India’s biggest FDIs ever. The MMD review further goes on to observe that there are other reasons for the decline as well, such as “persistent procedural delays, land acquisition issues and availability of quality infrastructure”. Indeed, delays in decision-making are visible in sectors like defence and multi-brand retail, discussions on which have been long in the works. The Department of Industrial Policy and Promotion (DIPP) had floated a discussion paper on defence in May 2010 and on multi-brand retail in July 2010. Feedback on these was received by parties interested in the sector, but a decision on allowing FDI into these sectors is still nowhere in sight. Riaz CAD (not including FII) is 2.5% of GDP well within control. FDI is not a holy cow or the only way to growth sometimes it may serve to drown promising domestic firms. This is in the long term much more beneficial to the Indian economy. Infact countries like S Korea and Japan effectively discouraged/ continue to discourage FDI resulting in strong domestic firms. I think this whole FDI is great line of thought is the result of IMF doctrine. A daily on Monday described the acute power shortage in Pakistan as an “existential emergency” as it called for establishing a national power management plan. Giving statistics, it said: “Our power shortfall has now reached 5,000 megawatts. We are generating 13,240 MWs against a peak demand of 18,065MWs. The editorial said that the problem is affecting every province. It went on to say that at the heart of the matter “lies the inability to resolve the circular debt crisis and an embedded inefficiency in power distribution along with power theft”. Calling it “an existential emergency”, it added that the country needs a national power management plan. ISLAMABAD: Pakistan is expected to produce at least 25 million tonnes of wheat in its 2010/11 crop, Finance Minister Hafiz Shaikh said on Friday, higher than the initial estimate. “We are expecting that our wheat crop this year will cross 25 million tonnes,” he told reporters. Industry officials had earlier feared the output would fall to 23.5 million tonnes against a target 25 million tonnes, after a decline in the area under wheat cultivation because of massive floods in 2010 and fertiliser shortages. A food ministry official said good output was expected because of increased fertility in wheat-growing areas after the floods. Pakistan produced a bumper crop of 23.8 million tonnes of wheat last year. The country consumes about 22 million tonnes a year. Harvesting of the 2010/11 crop is underway. Asia’s third-largest wheat producer, Pakistan resumed wheat exports in January for the first time in three years after the government lifted a ban in December. The three-year ban was lifted when the 2009/10 crop and carryover from the previous stocks led to market surplus. Traders earlier hoped to export up to three million tones of wheat this year, but the quantity may now exceed that following new wheat output estimates. The country had already exported or contracted to sell about 1.5 million tonnes of wheat so far. General Secretary Sindh Abadgar Board, Syed Mehmood Nawaz Shah, told The News on Thursday that contrary to outgoing financial year, all crops are likely to record bumper output in 2011-2012 thanks to timely and sufficient availability of water. He said that the problem is management of the upcoming bumper crops and they fear decline in prices as prices of cotton have gone down in the international market. Pakistan Central Cotton Committee has set a target of 15 million bales this year. Cotton has a share of 6.9 percent in agriculture and 1.4 percent in GDP. In 2010/11, major crops declined by four percent and farm sector recorded a modest growth of 1.2 percent. Cotton and rice production remained low because of floods and rain, but wheat and sugarcane recorded growth, which saved the agriculture sector from negative growth. Economic Survey of Pakistan 2010-11 said cotton was cultivated on an area of 2,689 thousand hectares, 13.4 percent less than last year (3,106 thousand hectares). The production is estimated at 11.5 million bales, lower by 11.3 percent over the last year’s production of 12.9 million bales and 17.9 percent less than the target of 14 million bales. The reasons for decrease in production is loss in area under cultivation due to floods, rains, widespread attack of Cotton Leaf Curl Virus (CLCV) and sucking pest in core and non-core area, shortage of water due to canal closure during flood. Shah said that CLCV attacked cotton in Punjab in the end of June, so this year they have sown early crop, whose results are still not known. Sugarcane was cultivated on an area of 988,000 hectares, 4.8 percent higher than last year’s level of 943,000 hectares. Sugarcane production for the year 2010-11 is estimated at 55.3 million tons as against production of 49.3 million tons last year, a rise of 12 percent. Sugarcane is a major raw material for the production of white sugar and gur and is also a cash crop. Its share in value-added sector of agriculture and GDP is 3.6 percent and 0.8 percent, respectively. Sources say that better market prices and timely payments by sugar mills encouraged farmers to grow more crop. Area sown for rice is estimated at 2,365,000 hectares, 17.9 percent less than last year (2,883,000 hectares). Rice has a share of 4.4 percent in agriculture and 0.9 percent in GDP. Pakistan grows high quality rice to meet both domestic demand and exports. Rice production is likely to decline by 26 percent to 5 million tons in 2010-11 from 6.8 million tons last year, said a market source. Rice export from Pakistan would be 2.6 million tons in FY2010-11 as compared with 3.8 million tons in 2009-10. Rice productivity in Pakistan increased from the 1960s to the 1990s. Since then, it has seen a fall of about one percent per year. Therefore, it could not keep up the pace with growing demand, Ahmad Jawad, CEO of Harvest Trading told The News. Major reasons for fall in rice production were floods and low market prices last year. Floods attacked mostly paddy growing areas in Sindh. Area and production target of wheat for 2010-11 had been set at 9,045,000 hectares and 25 million tons, respectively. Wheat was cultivated on 8,805,000 hectares, showing a decrease of 3.6 percent over last year’s area of 9,132,000 hectares. However, a bumper wheat crop of 24.2 million tons has been estimated with 3.9 percent increase over the last year’s crop of 23.3 million tons. Production of wheat increased due to timely fertiliser use and rainfall during pre-harvesting period. Wheat is the main staple food for most of the population and largest grain source of the country. It contributes 13.1 percent to the value-added sector of agriculture and 2.7 percent to GDP. Agreed, that some of the macro-indicators in Pakistan are showing healthy trends or resilience, exports are up, current account deficit is down, remittances are climbing, reserves are stable and the Pak Rupee is holding out, but gauging from the manufacturing and productivity figures over the last two quarters could Pakistan’s economy be finally sliding into a serious recession? Riding on the back of some positive figures, the economic managers have thus far not only been blowing their own trumpet of success, but also literally ignoring and mocking their critics, who have tried to draw their attention to the missed opportunities and rather weak economic scaffolding that can simply crumble one day without warning like a house of cards! Based on industrial production and productivity (especially in the small and medium enterprise sector) Pakistan’s economy contracted by nearly 4 percent - much more than expected - for at least two quarters running now, which basically means that technically we have already entered recession. Going by this, the big question actually should be that does the country have the political and economic will to fight its way out? The data underlines how the worst natural disaster (floods) to hit Pakistan in decades has foiled all hope of recovery and how the government’s addiction to borrow and the absence of visionary economic policies have contributed to the decline leaving the country in a vicious trap of high debt and a low growth amidst a rapidly rising population. The global scenario is not helping either. Serious downturns both in the United States (where the predictions of recovery continue to be proven wrong) and the Western European economies, the two main markets for Pakistani goods, mean that the coming months for Pakistani exporters will be even tougher. All political endeavours on ‘trade not aid’ and preferential ‘market access’ in lieu of our help in the war on terror have also not been fruitful so far. What this basically tells us is that to avoid sinking we need to look inwards and start taking our own measures to embark on a path of economic recovery before the recession turns into an economic quicksand. Time and again, I have pointed out to the examples of China, India and Bangladesh, who have consciously maintained focus on manufacturing at home as their ticket to sustained economic activity and job creation. To help keep their engine of the industry running all related state and private sector institutions, banking/financial, power and energy, human resource, commerce and trade, have played their due role. I don't believe India as a Utopian state and also I'm not an economist. Widespread problem still exist in India. Indian Government could not complete any project in time. World second Highest Railway Projects, Mumbai, Bangalore, Hyderabad Metro projects are still behind schedule. India has very bad ranking in ease of Starting business. Even in this case don't you think Pakistan is still lagging behind. Both Indian and Pakistani Rupee were about Rs. 35/Dollar in 1995. PKR was stronger than INR in 1993-94.It became PKR85=INR45 by 2010.you can check it here. Also I was going through some article which says Pakistan had higher per capita Income in 1950(with East Pakistan) and even upto 1991. The Indians today overtook it by small amount. Even the foreign debt of Pakistan is 3.5 times higher than its foreign exchange reserve whereas India's still less than its foreign exchange reserve. Also I was going through some article of yours which says Pakistan reduced its poverty from 65% for 1991-1999 to 22% in 2001-2006 and 17% by 2010.Whereas India from 50% to some 37%.It is hard to digest this fact of such a big difference.Can you clarify what measures Pakistan government took to achieve this because Pakistan had too less growth rate to achieve this(4-5% avg and Peak of 8.5 in 2004)and its booming period was 1980s. whereas Chinese economy was booming in this period 1974-2010. I know Indian government started NREGA scheme in 2005 to reduce unemployment and poverty in rural areas, a way to channelize money from economic boom towards rural areas. What was Pakistan's equivalent to reduce poverty from 65% to 17%? "Economy of Pakistan" article on Wikipedia still claims that Pakistan has 40% people living below poverty line as of 2010. Even un-employment rate in Pakistan is 2.5 times of India as 2011. I was also going through some article on Dawn which said 2.7% people have access to higher education in Pakistan.In India university education is highly subsidized. My sister's was paying just Rs.300/year($6.5/year) for Masters in Science degree.The engineering fee in elite Aligarh Muslim University is just Rs.1000/year (about $22/year). Pakistan spend less on education as compared to India even on percentage basis. Right now 8-9% Indians can afford expensive private Engineering and Medical education. India may have a huge population of illiterates, the most illiterate state of Bihar in India has right now higher literacy rate than most educated Punjab or Sindh in Pakistan. India too have high corruption Index right now , it was equivalent to Pakistan in 1995 but improved considerably in last 15 years. The milestones may be Right to Information act or upcoming Jan Lokpal Bill. Pakistan economy grew at 2.2% as against India's 8.5% in 2010. Pakistan still face some grave problems like power shortage and Taliban insurgency, ethnic strife in Karachi.As of 2010 India's too have a communist insurgency in tribal areas and some poor non-tribal areas of eastern India. Except Manipur in north-east right now all separatist are on peace talks with government. It is very bad to talk about number game as India has a 1.2 Billion population. The number of Middle class in India is twice the total population of Pakistan. India's GDP size is equivalent to developed Canada.The foreign exchange reserve of India is about twice the size of whole Pakistan's GDP. Though Pakistan's population is only 1/6.5 times of India. India's GDP size is 9 times. In the last I will still say India is not a Utopian state but somewhat better than Pakistan because Pakistan too, still suffering with same Problems. The economic boom of India had started showing its result only after 2003. Ashok: "I know Indian government started NREGA scheme in 2005 to reduce unemployment and poverty in rural areas, a way to channelize money from economic boom towards rural areas. What was Pakistan's equivalent to reduce poverty from 65% to 17%? "Economy of Pakistan" article on Wikipedia still claims that Pakistan has 40% people living below poverty line as of 2010. Even un-employment rate in Pakistan is 2.5 times of India as 2011. " The closes thing Pakistan has to NREGA is BIS (Benazir Income Support) program. But I give no credit to it for lower poverty relative to India. Indian society id inherently more unequal than Pakistani society because of the caste system. Thank you for replying.I myself belong to low caste Hindu. My grandfather was a very poor man and could not feed his family. There are some isolated incidents in rural areas but things have changed too much. Well caste system do exist in India but its eroding fast. In India people are grouped in 4 groups viz. General, SC, ST and OBC(Other backward Caste) which mostly include Hindus, Christians and Muslims. And there is 50% affirmative action policy in all type of government run education systems, government jobs and even Parliament Seats and State Legislatures. In South Indian states it even up to 65%. In 1950 untouchability was made a crime in India with fine and 6 months jail term and is rarely heard today.Most of the tribal are either Hindus or Christian and they too are economically weak. Apart from this minority communities too get extra development funds from government. As per today now high caste Hindus complain, they are being marginalized by affirmative action against SC/ST/OBC. Also in India, even Muslims follow caste system. When Islamic rule stated in India all foreign origin Muslims like Turks,Arabs,Persians, Central Asians, some high caste Hindus who converted to Islam became Ashrafs or High caste and other Indian converts became Ajlafs or Pasmanda. Most of the Ashrafs migrated to Pakistan after partition. Today 80% of Indian Muslims are considered Low Caste Muslims and comes under OBC quota and some under SC also. Good things among Muslims that they didn't suffer untouchability but no improvement in economic condition. Since 80% Indian Muslims are Pasmanda, that is also one reason for backwardness of Indian Muslim. During OBC reservation movement in 2005-2006 all Muslim organisations of India supported this move.There is also groups like All India Pasmanda Muslim Mahaz spearheading for the rights of these groups within Muslim community. Well when SC/STs are considered they are getting highest preference of all, they get highly subsidized fee structure and quick promotions in Government jobs when compared to other two groups. Even they have reserved seats in federal Parliament and State Legislatures. In most of the states in all over India, the elected Chief Ministers belongs these three groups. I don't think 3000 years thing will erode in a 50-60 years but things are on track as these three groups (SC/ST/OBC) control everything politically in India right now. Also, You still didn't answer for Pakistan's success story from 65% to 17%.Chinese can claim this as they had impressive growth of 12% since 1975-2010. If Pakistan can't do a major change between 1950-1999, how come suddenly such a giant Leap from 1990-1999 to 2000-2010. Ashok: "Also, You still didn't answer for Pakistan's success story from 65% to 17%.Chinese can claim this as they had impressive growth of 12% since 1975-2010. If Pakistan can't do a major change between 1950-1999, how come suddenly such a giant Leap from 1990-1999 to 2000-2010." First, let me correct you. Pakistan's poverty rate declined from 34% in 1999 to 17% in 2008, as reported by the World Bank. Second, Pakistan is the most egalitarian society with the lowest Gini Index in South Asia. Third, Pakistan leads South Asia in philanthropy. Jakat is one of the best heritage Muslims have ever got. GINNI ratio of Pakistan(0.30) is lower than India's(0.36) which shows Pakistan has less rich vs poor income difference.That of China is about 0.44. Pakistani economy was booming in 1980s and India was watching its worst economic nightmare in 1980s which came to a climax in 1991 when India had just $1 Billion foreign exchange reserve. In 1991 poverty in Pakistan was 65%, that's of India was 53% (According to the chart you furnished). Pakistan's per capita income was more in 1947 than India which shows it had less number percentage of poor people than India. When Pakistan had better economic development rate and the effect of Jakat System could bring down poverty to just 65% in 1947-1991 as compared to India could bring it down to 53% with lower GDP growth and no charity system. Is is really possible to uplift 48% of population in two decades. I know in 1990s Pakistani economist use to comment on PTV "We had an impressive growth in 1980s which is absent in this decade".Pakistan was in number of Political crisis from Zia's death to Musharraf's coup. After atomic test,during 1998-2001 Pakistan was in economic chaos because of economic sanctions. 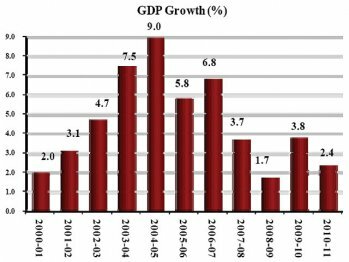 First few years during Musharraf's rule were impressive with growth rate reaching 8.5% in 2004. After 2006, Taliban insurgency hardly hit Pakistan's economy reducing its growth. Also a country won't constantly discuss poverty on TV when it is just 17%. All this things still make me to believe 40% poverty rate(almost same as India's) because it is impossible to uplift "48% of population" in just 20 years as against 44 years period of 1947-1991 when Jakat system had always existed. I don't call India as a Utopia. That's why India has too much poor people and could not reduce the poverty like China did. Pakistan too have a culture of naming things or projects on the name of politicians like India do. I didn't know that. Ashok: "All this things still make me to believe 40% poverty rate(almost same as India's) because it is impossible to uplift "48% of population" in just 20 years as against 44 years period of 1947-1991 when Jakat system had always existed." Poverty rates are not a matter of opinion; it's data that is reported by agencies like the World Bank. Overall, the latest World Bank data shows that India's poverty rate of 27.5% is more than 10 percentage points higher than Pakistan's 17.2%. Assam (urban), Punjab and Himachal Pradesh are the only three Indian states with lower poverty rates than Pakistan's. "The poverty increase situation thus stood as follows: 22.3 percent of the population in 2005-06 to between 30-35 percent in 2008-09; now this population is beyond 40 percent." Here is the link to the News. The report you mentioned, is that based on exact GDP/capita?? Because the above article mentions poverty of 40% due of inflation which affected purchasing power in Pakistan. As far as Assam is considered, it is really astonishing it made itself in best three. Because whole of Eastern and North-Eastern India are considered poor and backward and remaining three regions as prosperous. And Haryana is equivalent to Punjab because both have same economic model of agriculture and together produce 40% India's foodgrains. Highly Industrialized western and South India too also have very less poor people. Ashok: "I am totally confused now. What data to believe. I got an article from Pakistani newspaper (Jang Group) "The News" titled "Statistics reveal stunning increase in poverty" dated 16/02/2010 ." Which do you find more believable? First hand information from the primary source, the World Bank report, whose link I shared with you? Or the second hand information from a newspaper story? Ashok: "As far as Assam is considered, it is really astonishing it made itself in best three. Because whole of Eastern and North-Eastern India are considered poor and backward and remaining three regions as prosperous." Please look at the World Bank poverty bar graph carefully. Assam (urban) is much better off than Assam (rural) and most of the rest of India, except Punjab and Himachal Pradesh. The Statistics Division has requested some 0.2 million Pakistan Army officials to assist in providing security to the staff conducting the census and to help in collecting data, in case they are required. “Army personnel will only respond to distress calls of enumerators in case they face resistance in sensitive areas of the state,” Secretary Statistic Division, Asif Bajwa, said on Thursday. Addressing a press conference, Bajwa said, “The Pakistan Army, Rangers, Frontier Constabulary, Levies and other paramilitary forces have offered to support the survey teams.” He however ruled out any resistance from miscreants in volatile areas of the country especially in Balochistan, Khyber-Pakhtunkhwa and the tribal belt. The census will cost Rs5 billion. After the 1998 census, Pakistan’s population was estimated to be 132 million while according to recent data the population has risen above 175 million. Apart from Pakistan, 73 countries have started the process. Bajwa said that the first phase of the census, which is now underway, includes house listing. In this phase three forms will be distributed among the population and summary sheets of house materials will be compiled by 19th April. The main operation will begin on October 6 during which form 2A – a questionnaire related to demographic and social characteristics, literacy, geographical area, economic characteristics and fertility – will be circulated. The division has stated that no details will be made public till the completion of whole process. The staff conducting the census will be supervised by 3,626 district officers and tehsildars. Some 22,408 circle supervisors will also collect details of houses to conduct a detailed survey of urban and rural areas, Bajwa said. He said that teams will conduct surveys in 25 divisions, 139 districts, 424 census districts, 533 tehsils, 62 towns, 1,470 urban union councils, 50,612 villages, 6,055 rural union councils, 62 towns of city districts, 174 municipal committees, 286 town committees and 43 cantonments. Data will also be conducted in 14 tehsils of volatile Khyber-Pakhtunkhwa which include Chitral, Dir, Malakand and Kohistan. House listing in various villages of Fata and Gilgit-Baltistan will also be undertaken. Bajwa said that the flood affected population will also be included. “We will go into every tent of the IDPs to ensure their count,” he said. Inflation is the price that ordinary Asians are paying for high growth rates. For the less well-off, who spend their money on food and fuel, the story is even worse. The rise in their household expenses at the moment is usually higher than headline inflation rates. According to the International Monetary Fund, last year consumer prices rose 13.2% in India, 11.7% in Pakistan and 9.2% in Vietnam. Other Asian nations coped better but the average for developing Asia was 6% - compared to a 1.6% average rise in prices in advanced economies. The speed at which prices are shooting up means that unless people find ways to save and invest effectively, they in fact get much poorer - even if Asia is getting richer. The world is jealous of Asia's sky-high growth rates, but for ordinary people the price of success is corrosive inflation which could eat away their savings. "From outside it looks good," says Manasi Pawar. "We're staying in a big house, paying so much in rent and our kids are going to great schools." Manasi, a qualified software worker in hi-tech Hyderabad in India, recently became a full-time mother. Her husband also works in the IT industry. The couple epitomise the emergence of a well-to-do middle class in Asian countries - except there's one significant snag. "We were actually losing money," says Manasi. The couple recently woke up to the fact that inflation rates of nearly 9% meant that their savings were actually disappearing in front of their eyes. "We were sitting on a bunch of cash but we didn't know where to put it, and it's important that we don't let it lie there in the bank - because a bank doesn't give an interest rate that even matches the inflation rate," she says. The poorest people in society, who spend disproportionately more on food, are hit most savagely of all. But there is a way to fight back against inflation: to save, and to put some of that money in a part of the economy that rises along with inflation. For most people, that means investing in shares or equities. "The only way you can make money long-term is through an equity linked product," says Ms Halan. Money in the bank in India may only earn 3% or 4% - which in fact means you are losing money. But equity linked funds in this exploding economy have risen much faster, sometimes as high as 25%. Although the economy continues to show high GDP growth, there is a growing disparity between India's sea of poor people and the few at the top of the heap. Out-of-control inflation, caused by the inflow of billions of dollars in hot money, combined with poor productivity due to weak physical infrastructure has resulted in corruption of unimaginable proportions, which has eaten away the gains made earlier. Prime Minister Manmohan Singh, who heads a group of disparate political parties under the banner of the United Progressive Alliance, is busy keeping the coalition government in power by doing little to prevent further deterioration of the nation's economy. On June 16, the Reserve Bank of India (RBI) raised its benchmark lending rates for the tenth time in 18 months, as a monetary measure to slow down the rampaging inflation monster, which has already greatly hurt the poor, and is now beginning to hit the middle class, which had benefitted in recent years from the GDP growth and wage rise. The earlier nine such monetary measures within the past 18-month period did not slow down inflation. It is inevitable that the high interest rates will attract more short-term hot money into the country, spurring a faster rate of inflation in the coming days. India has earned the distinction of incurring the highest inflation of major emerging markets. On June 14, the Singh government said inflation had increased 9.1% in May, compared with a year earlier, a rate higher than expected. High inflation was first observed two years ago in the rise of food prices that affected India's poor the most. But since India's hundreds of millions of poor have little voice in directing New Delhi's economic policies, for the greater part of the last two years such inflation was pooh-poohed by Indian economists, accusing the growing army of the middle class of "over-consumption of food." Now, inflation has shown up everywhere, once again, proving the shortsightedness of those economists. What this picture, which I elaborate below, underscores, is the inescapable truth that if a fundamental shift away from the monetarist system is not initiated in the United States, and soon, we are looking at the literal devastation of the largest population centers in the world, such as India and China. This is, in fact, the concern of all humanity - and must be stopped. The Growing Anti-Poor Bias Unwilling to change course, and stubbornly defending the failed economic policy, New Delhi is still harping on India's high GDP growth rate. The New York Times reported on June 15, that Kaushik Basu, the government's chief economic advisor, said, in an interview on June 13, that inflation was a problem that all developing countries were facing. "If you look at emerging economies around the world," Basu said, "India's performance looks pretty run of the mill." But, neither Basu nor others in the Singh government are interested in taking a good look at the damage done by their strictly money-obsessed policies. "The last two years have been a lost opportunity" for India's governing United Progressive Alliance party, Citigroup said this month in a research report. Per capita income of Indians grew by 14.5 per cent to Rs. 46,492 in 2009-10 from Rs. 40,605 in the year-ago period, as per the revised data released by the government on Monday. The new per capita income figure estimates on current market prices is over Rs. 2,000 more than the previous estimate of Rs. 44,345 (one nominal US dollar equals INR 44.34909, and PPP USD equals INR 18) calculated by the Central Statistical Organisation (CSO). Per capita income means earnings of each Indian if the national income is evenly divided among the country's population at 117 crore. However, the increase in per capita income was only about 6 per cent in 2009-10 if it is calculated on the prices of 2004-05 prices, which is a better way of comparison and broadly factors inflation. Per capita income (at 2004-05 prices) stood at Rs. 33,731 in FY10 against Rs. 31,801 in the previous year, the latest data on national income said. The size of the economy at current prices rose to Rs. 61,33,230 crore in the last fiscal, up 16.1 per cent over Rs. 52,82,086 crore in FY'09. Based on 2004-05 prices, the Indian economy expanded by 8 per cent during the fiscal ended March 2010. This is higher than 6.8 per cent growth in fiscal 2008-09. The country's population increased to 117 crore at the end of March 2010, from 115.4 crore in fiscal 2008-09. India is poised to join the coveted club of economies whose national income, or gross domestic product, exceeds $2 trillion. According to recently released data, India's nominal GDP is expected to grow at 14 per cent in 2011-12, to reach Rs 90 lakh crore (Rs 90 trillion). At a dollar exchange rate of Rs 45, this works out to $2 trillion. However, if inflation is assumed to be 7 per cent and the real growth rate is 9 per cent as projected, the growth rate of 14 per cent may actually understate nominal growth rate by 2 percentage points, which means India's nominal GDP in dollar terms will actually exceed $2 trillion this fiscal! India's nominal GDP crossed the $1-trillion mark in 2007-08, which implies GDP has doubled in four years. First, the magic number of $2 trillion is based on an exchange rate of $45 to the dollar. If the rupee were to depreciate, India's nominal GDP would be lower for the same level of output. Second, in celebrating the nominal as opposed to the real GDP, we may be losing sight of the contribution of inflation. The difference between real and nominal GDP is inflation, and so for a given level of real GDP, the higher the inflation the more rapidly would nominal GDP increase. This is clearly an undesirable outcome for everybody. Statistical convolutions aside, the health of the Indian economy needs a candid review, particularly in light of potential downsides that could derail the genuine progress the Indian economy has made over the past two decades. The slowdown in virtually all sectors of the economy, barring a few select industries like 'transport, logistics and communication', which has been growing annually at 25 per cent, is indeed worrisome. Growth in the agriculture sector continues to be dampened by under-investment, despite some increase during the past five years. This has resulted in the sector being caught in a classic low productivity trap. Manufacturing too is spinning on its wheels, with annual growth rates stubbornly in the single digits. This reflects deeply embedded structural problems, which have been discussed in this space. India's economic growth continues to rely on the service sector growing at or around 10 per cent annually, which renders it vulnerable to global shocks. The situation on the supply side also leaves a lot to be desired. This particularly applies to the tardy progress in the development of infrastructure and investment in human development, which is already holding India back. Dear Riaz, an exceptionally well researched and refered blog. Thanks for the insights to both South Asian neoighbours economies in a very candid and lucid manner. Mohan and Ashok may be arguing their points but for us - the South Asians, true picture is ore important than who is better, for the sake of masses. Thanks. The ongoing economic crisis across the world after downgrade of the United States credit rating would have a positive impact on Pakistan’s economy as analysts said that the current account balance would stay in surplus and the electricity subsidy will automatically be contained. The United States credit rating downgrade after enhancement of debt ceiling rattled the stock markets around the globe and majority of the equity markets have touched their lower locks. While major commodities, except gold, have also witnessed sharp decline in their prices after 2008. “With the decline in oil prices globally, Pakistan’s current account balance is likely to stay in surplus and the electricity subsidy will automatically be contained,” according to a JS research report on Tuesday. The report said that the growth is expected to rebound due to the bumper agriculture crops and inflation would tame further, whereas equity market will remain resilient compared to its regional peers due to lower foreign exposure. “However, political instability and deteriorating law and order situation are the key risks to the economy,” it added. Analysts said that the present global crisis is different to 2008. The crisis of 2007/08 was driven by excessive overheating of the global economy and resultantly commodity and real estate markets touched their peak levels. In that crisis, Pakistan suffered as a result of higher global commodity prices and the government flawed domestic prices of providing huge subsidy. “As a result, the twin deficits hit 16.3 percent of the GDP,” the JS report revealed, adding that this difficult scenario led to the International Monetary Fund (IMF) programme in order to bailout the economy from the brink of collapse. However, the report said that in 2011/12 crisis Pakistan’s macros will be resilient and will benefit from the decline in the global commodity prices. “Unlike 2008, Pakistan’s real interest rates are positive, real effective exchange rate is not overvalued and subsidies are largely contained,” it added. About the United States austerity plan and its impact on Pakistan, experts believed that the United States is unlikely to reduce its spending towards the war on terror. The American economy is going through its worst period in history, where Obama’s administration is left with very little fiscal space to finance its ballooning fiscal deficit that is around nine percent of the GDP. The stimulus package of post-Lehman crisis has left the Federal Reserve Bank of America literally with no option either. To smooth the functions of the US Treasury, the lawmakers have agreed to provide additional $2.4 trillion to the debt ceiling, subject to deficit saving of approximately $1 trillion over the next decade. This year the Americans are unlikely to reduce their spending as the austerity measures decided will be implemented from 2013 onwards, experts said. The JS report said that the United States will continue to pay for counterinsurgency programme in Afghanistan even if it plans to pullout from Afghanistan by 2014. On Pakistan’s front, the United States will definitely play the role of the devil’s advocate and delay the due payments or reduce the grant size, according to the report. Overall, the presence of the United States in Afghanistan will keep the dollar flows continued into Pakistan directly or indirectly, the report said, adding that the United States rationalisation of budgets will have a bare minimum impact on Afghanistan and Pakistan. The Minister of State (Independent Charge) for Statistics and Programme Implementation Shri Srikant Kumar Jena has said that the Per Capita Income at the national level, which was Rs. 24,143 in the year 2004-05, stands at Rs. 54,835 in the year 2010-11, showing an increase of more than 120%. The details of State/UT-wise per capita income (Net State Domestic Product at factor cost) at current prices, for the years 2004-05 to 2009-10, as compiled and provided by the Directorates of Economics & Statistics of the States, are given in the table at Annex. Using 18 INR to a PPP dollar, Indian PPP per capita income for 2011 works out to $ 3,046. Nominal per capita incomes in both India and Pakistan stand at just over $1200 a year, according to figures released in May and June of 2011 by the two governments. This translates to about $3100 per capita in terms of PPP (purchasing power parity). Using a more generous PPP correction factor of 2.9 for India as claimed by Economic Survey of India 2011 rather than the 2.5 estimated by IMF for both neighbors, the PPP GDP per capita for Indian and Pakistan work out to $3532 and $3135 respectively. Nominal per capita income of Indians grew by 17.9 per cent to Rs 54,835, or $1218, in 2010-11 from Rs 46,492 in the year-ago period, according to the revised data released by the government in May, 2011 as reported by Indian media. In June 2011, Economic Survey of Pakistan reported that the nominal per capita income of Pakistanis rose 16.9 percent to $1,254 in 2010-11, up from $1,073 in 2009-2010. Inflation in India rose to 9.78% in August, its highest level in a year, officials say. The increase was mainly due to the rising cost of food, fuel and manufactured goods across the country. Inflation is a major headache for the Indian government and the central bank has raised interest rates 11 times in 18 months to try to keep a lid on it. Despite this, a senior government adviser has said he thinks inflation will stay between 9-10% this year. There are fears that that the Reserve Bank of India will continue to raise rates as inflation has remained high. Correspondents say that the bank is now in the awkward position of fighting high prices amid mounting worries about the health of the global economy. The government is projecting growth of 8.5% for the fiscal year that ends next March. But the growth rate is threatened by the rising prices - which limit domestic consumers' spending power. A further curb could come from lower export demand as developed countries struggle with low or no economic growth. Young people stroll the promenade eating burgers and fries and browsing through 60 stores and stalls that sell everything from high fashion to silver bracelets to ice cream. Ornate benches dot a landscaped area around a 150-year-old banyan tree. “Port Grand is something fresh for the city, very aesthetically pleasing and unique,” says Yasmine Ibrahim, a 25-year-old Lebanese American who is helping set up a student affairs office at a new university in Karachi. One-third of Pakistan’s 170 million people are under the age of 15, which means the leisure business will continue to grow, says Naveed Vakil, head of research at AKD Securities. Per capita income has grown to $1,254 a year in June from $1,073 three years ago. The appetite for things American is strong despite the rise in tensions between the two allies. Hardee’s opened its first Karachi outlet in September: In the first few days customers waited for hours. It plans to open 10 more restaurants in Pakistan in the next two and a half years, says franchisee Imran Ahmed Khan. U.S. movies are attracting crowds to the recently opened Atrium Cinemas, which would not be out of place in suburban Chicago. Current features include The Adventures of Tintin and the latest Twilight Saga installment. Mission: Impossible—Ghost Protocol is coming soon. Operator Nadeem Mandviwalla says the cinema industry in Pakistan is growing 30 percent a year. Exposure to Western lifestyles through cable television and the Internet is raising demand for these goods and services. Pakistan has 20 million Internet users, compared with 133,900 a decade ago, while 25 foreign channels, such as CNN (TWX) and BBC World News, are now available. And for many Pakistanis, reruns of the U.S. sitcom Everybody Loves Raymond are a regular treat. The bottom line: With per capita income rising quickly, Pakistan is developing a mass market eager for Western goods. Reduction in povertthat you say only due to the american help.you can not reduce this poverty by own resoure and skill so dont broaching and argument about indian economy because indian economy growth is real and with help of any other country. India has become the fourth largest economy in the world due to a strong economic growth but still has a low per capita income, the Economic Survey revealed today. “India has emerged as the fourth largest economy globally with a high growth rate and has improved its global ranking in terms of per capita income. Yet, the fact remains that its per capita income continues to be quite low,” it said. “India has moved up the ranks, but is still the poorest among the G-20,” the survey added. The per capita income of India stood at $ 1,527 in 2011, it said. “...this is perhaps the most visible challenge. Nevertheless, India has a diverse set of factors, domestic as well as external, that could drive growth well into the future,” the survey said. Between 1980 and 2010, India achieved a growth of 6.2 per cent, while the world as a whole registered a growth rate of 3.3 per cent. As a result, India’s share in global GDP more than doubled from 2.5 per cent in 1980 to 5.5 per cent in 2010, it said. Consequently, India’s rank in per capita GDP showed an improvement from 117 in 1990 to 101 in 2000 and further to 94 in 2009. China, however, improved its rank from 127 to 74 during the same period. G-20 or the Group of 20 nations was formed in 1999 after the East Asian crisis as a forum of finance ministers and central bank governors. Meanwhile, the survey said any slowdown in eurozone, which accounts for 19 per cent of the global GDP, could impact the Indian economy. The International Monetary Fund (IMF) has forecast that the eurozone is likely to go through a mild recession in 2012. The size of Pakistan’s economy increased to Rs20.653 trillion and per capita income in dollar terms stood at $1,372 after the revision of GDP growth estimates from 3.2 percent to 3.7 percent for the outgoing fiscal year 2011-12. “The per capita income on market price basis has increased by 9 percent in the outgoing fiscal year as it went up to $1,372 in 2011-12 compared to $1,258 in the last fiscal year 2010-11,” an official working paper available with The News disclosed. The per capita income will be officially unveiled in the Economic Survey 2011-12 which will be launched a day ahead of the upcoming federal budget 2012-13. The economic managers, sources said, have used average exchange rate at Rs88.31 against a dollar for the first nine months (July-March) period of the outgoing fiscal year and estimated population at 178.9 million. If average exchange rate of first ten months (July-April) is used, which is at Rs88.7 to a dollar, then per capita income will fall to $1,354 for outgoing fiscal year. It is yet to see which average of exchange rate is taken by the government to estimate per capita income. After revision of GDP growth estimates up to 3.7 percent by National Accounts Committee (NAC) by abandoning rebasing exercise and deciding to use the previous base year of 1999-2000, the size of the economy increased by Rs2 trillion and went up to Rs20 trillion from earlier estimates of falling around Rs18 trillion. The rise in size of the economy has helped the government to restrict its budget deficit in the range of 6.7 percent to 7 percent of GDP for the outgoing fiscal year. The one percent of GDP, equivalent to Rs206 billion, means that the budget deficit in rupee terms will be standing at Rs1,442 billion in case of deficit of 7 percent of the GDP. The Pakistan Statistical Bureau (PSB) had committed blunders in this rebasing exercise as authorities estimated that the financial sector that was shown falling by negative 11 percent in 2011-12 by using base year of 2005-06 but it actually achieved plus 6 percent growth in 2011-12 on the basis of previous base year 1999-2000. The economic deflator grew by 9.5 percent in outgoing fiscal year from revised estimates of over 18 percent in last fiscal year 2010-11, indicating that it declined by almost 100 percent. The reasons for this massive decline in deflator was attributed to highest ever increase in cotton prices in international market that surged up to 129 percent in last fiscal year 2010-11 resulting into jacking up deflator in a massive way. The prices of cotton are not catered into CPI based inflation so it was reflected by end of the last fiscal year through deflator while in outgoing fiscal year the prices of cotton dropped significantly so the deflator in outgoing fiscal year also declined. In the last Economic Survey 2010-11, it was stated that Pakistan’s per capita real income had risen by 0.7 percent in 2010-11 as against 2.9 percent last year. Per capita income in dollar terms rose from $1,073 last year to $1,254 in 2010-11, thereby showing an increase of 16.9 percent. This is mainly because of stable exchange rate as well as higher growth in nominal GNP. Real private consumption rose by 7.0 percent as against 4.0 percent attained last year. However, gross fixed capital formation lost its strong growth momentum and real fixed investment growth contracted by 0.4 percent as against the contraction of 6.1 percent in last fiscal year. India's per capita income for 2011-12 Rs 60,972, according to Economic Survey of India 2011-12. It translates into US $1143.09, using INR 53.25 to a US dollar. The preliminary official estimates are indicating that Pakistan's nominal per capita income has increased by 9% to $1,372 in 2011-12 from $1,258 in 2010-11. In its fourth year, the Pakistan Peoples Party (PPP)-led government managed to miss all its economic targets, except containing inflation. 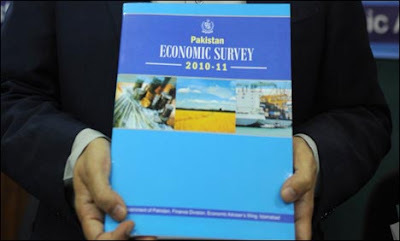 The Economic Survey of Pakistan, to be unveiled by Finance Minister Dr Abdul Hafeez Shaikh on Thursday (today), states that growth in the outgoing fiscal 2011-12 clocked in at 3.7%, markedly below the target of 4.2%. The biggest admission of failure in the budget paper is that half of the industrial capacity remains idle, primarily due to the energy crisis. Growth next year can therefore be achieved without any new investment, simply by tapping this idle capacity. The finance minister, however, will try to mitigate the impact of domestic policy failures and cite global woes for most domestic problems, and also place some responsibility on nature, or the ‘Great Floods’. “The progress on resolution of war on terror could have offered support to economic growth in 2011-2, but at the beginning of the current fiscal, natural calamity struck,” the paper states. Meanwhile, national savings fell to 10.8%, against a target of 13.2%, and investment fell to 12.5%. The government’s economic managers confessed that they have failed to manage subsidies, resulting into a higher budget deficit. The paper states that excluding Rs391 billion circular debt payments, budget deficit has crossed 4.3% of gross domestic product (GDP) and the revised target will be difficult to achieve. The paper states that the central bank reduced its policy rate by 200 basis points, from 14% to 12%, in order to keep real interest rates from suffocating growth. Due to the surge in government borrowings, money supply grew by 8.7% during the first 10 months of the outgoing fiscal. Meanwhile, net foreign assets of the banking sector reduced by Rs261 billion in the first 10 months, as opposed to an increase of Rs174 billion, last year. The contraction was mainly due to lower external inflows and higher current account deficit – the gap between foreign receipts and payments, the paper states. It adds that pressure on the rupee is likely to continue due to uncertain foreign inflows, and substantial government borrowing to finance the budget deficit. Against the annual target of $1.4 billion, or 0.6% of GDP, current account deficit widened to $3 billion in the first nine months of the outgoing fiscal, according to the document. The entire contribution to this surge came from trade imbalance, which stood at $12.8 billion in nine months, the paper adds. “Exports could not sustain the pressure of falling global demand and domestic supply side constraints,” it states. ...A $ 100 note is exchangeable today at around Rs 4,500. But with Rs 4,500, you can buy more goods and services in India than with $100 in the US. Therefore, India's GDP expressed in dollars at current exchange rates is lower than what it would be when adjusted for PPP, i.e. the exchange rate reflecting a currency's effective local buying power. The Survey estimates India's PPP correction factor at 2.9, meaning the stuff available here for $100 will cost $290 in the US. That corresponds to an exchange rate of roughly Rs 15.5 to the dollar. But the interesting bit is about the linkage with GDP. Countries with per capita GDP of $1,000-1,400 in 2009 – which include India, Pakistan and Vietnam — have an average PPP adjustment factor of 2.3. In comparison, those with per capita GDP (unadjusted for PPP) between $8,000-12,000 — the likes of Brazil, Mexico, Russia and Turkey – require a correction of only 1.6 or thereabouts. From this follows the conclusion that as economies grow, the required PPP adjustment also falls. Thus, India currently has a per capita GDP of $1,300 with a PPP correction of 2.9. If the present high growth rates continue, its per capita GDP would touch $10,000 in 2039. By then, its PPP correction factor, too, would have dropped to 1.6, implying that the same basket of commodities costing $290 in the US (assuming no inflation there) will now be available here for $181, as against the earlier $100 level. The fall in the PPP adjustment factor from 2.9 to 1.6 by 2039, in turn, entails either (a) an appreciation of the rupee to Rs 24.9 to the dollar or, (b) prices in India rising cumulatively by 81 per cent or 2 per cent per annum in constant dollars or, (c) a combination of both. Assuming three-fourths of the reduction to happen via (b), it would translate into an average annual dollar price inflation of 1.5 per cent in India. And that is what the Survey (more precisely, Dr Basu) calls ‘PPP catch-up inflation'. Elegant though this formulation is — as is to be expected from our erudite Professor — it is not without flaws. The main problem has to do with the direction of causality. Does inflation result from PPP levels aligning themselves closer to market-determined exchange rates? Or, is it just the other way round, wherein inflation is a cause rather than effect of PPP catch-up? The Basu formulation — an adaptation of the so-called Balassa-Samuelson effect — seemingly presumes PPP catch-up to be the causal variable, which necessarily engenders inflation. To quote from the Survey: “…due to this apparent fall in the PPP correction factor, there would be some increase in prices…(The country) would face an inflation of 2 per cent per annum solely on account of this PPP adjustment”. In the real world, however, things probably work in the reverse. As inflation erodes the rupee's domestic purchasing power, the basket of goods and services that can be bought with Rs 4,500 will shrink over time. Assuming no corresponding depreciation of the rupee, domestic prices would increasingly approach global levels. In the process, the PPP exchange rate is driven nearer to the market-determined exchange rate. We are, in other words, talking of ‘inflation catch-up PPP' as opposed to ‘PPP catch-up inflation'! The phenomenon of ‘inflation catch-up PPP' can be seen in India, where the rupee has, over the years, emerged as a ‘lamb' at home and a ‘tiger' abroad. Since 2004-05, it has depreciated by hardly 4 per cent against the dollar, which is way below the 46 per cent rise in the all-commodities wholesale price index..
India may turn into a $2-trillion economy by the end of this financial year, provided the rupee remains below 50.79 against the dollar during this period. The government has projected India's gross domestic product (GDP) for 2012-13 at Rs 101 lakh crore, against Rs 88 lakh crore in 2011-12—a growth of 14.7 per cent. In 2011-12, when the rupee stood at an average of 47.95 against the dollar, the size of the economy was $1.84 trillion at current prices (including indirect taxes). A growth of 14.7 per cent would mean the economy would expand to $2.11 trillion. The catch, however, is the rupee stood at 47.95 against the dollar in 2011-12, while its average exchange rate against the dollar so far this financial year is 53.24. At this rate, by the end of 2012-13, India would be a $1.9-trillion economy. Any further depreciation in the rupee would further reduce the size of the economy in dollar terms. On Thursday, the rupee fell to a record low of 56.52 against the dollar. It has depreciated 14 per cent from its high this year, exerting pressure on the trade and current accounts. With limited foreign exchange reserves and reforms unlikely, analysts expect the rupee to depreciate further in the coming days, with a recovery unlikely anytime soon. “The high inflation, sluggish growth, poor flows and the strengthening dollar index would continue to drive the rupee to new lows. We expect the rupee to breach 57-levels soon,” said Abhishek Goenka, chief executive, India Forex Advisors. In 2010-11, when the rupee stood at an average of 45.57 against the dollar, India’s GDP stood at $1.68 trillion, while it was $1.36 trillion in 2009-10, at an average exchange rate of Rs 47.42/dollar. GDP growth at constant prices (excluding indirect taxes) stood at 5.3 per cent in the quarter ended March 31, with growth in financial year 2011-12 at 6.5 per cent—the lowest in nine years. “This persistent sluggishness in the economy puts the Reserve Bank of India in a conundrum. It has to cut interest rates to stimulate growth. However, it can’t cut much, as this would lead to more depreciation in the rupee,” said Bundeep Singh Rangar, chairman of London-based consulting firm IndusView. Though the central bank had cut policy rates by 50 basis points in April, it had warned it saw limited scope for more any cuts, partly because inflation remained high. As per you India’s calculations are bogus but strangely it’s Pakistan that keeps restating it’s GDP. And NO we are not going to click on your sad little web link. But then if you are happy to live in your little bubble then so be it. Anon: A"As per you India’s calculations are bogus but strangely it’s Pakistan that keeps restating it’s GDP"
India has restated its GDP more often than Pakistan. The advance estimate of GDP growth for 2000-01 was 6%, this was revised to 5.2% in 2001, was reduced to 4% in 2002 and then raised again to 4.4% in 2003! The estimate for the 2006-07 agri-GDP growth figures was updated from 3.9 to 6 per cent around the end of January 2007; a rare, but by no means unique, occurrence. But agriculture is not the only culprit. The Index of Industrial Production Manufacturing for Dec ‘06 growth reported in Feb ‘07 was 11.9 per cent, it was then revised upwards to 13.4 per cent and now final estimates in May are at 14.5 per cent. The actual Gross Domestic Product (GDP) of Pakistan is nearer to $300 billion and not $210 billion, as is shown officially. And, if the ailing economy of the troubled Pakistan is assumed to grow by 3 per cent per year by 2015 the size of the actual GDP would likely to set between $ 350 and $ 375 billion. This was stated by Managing Director KSE Nadeem Naqvi while briefing the visiting V. Shankar, Member of the Board, Standard Chartered Bank PLC and CEO Europe, Middle East, Africa and Americas here at Karachi Stock Exchange (KSE) on Wednesday. “Using conservative estimates, 50 per cent of the economy is in the undocumented sector,” Naqvi said adding that further estimation showed that the per capita income of top 10 per cent of households in Pakistan was near $5,000 versus national per capita income of $1,190. “This represents a significant potential market for investment and financial services,” the MD added. Also, Naqvi highlighted the areas where KSE and SCBPL could cooperate that, he said, include investor awareness generation, attracting Non-Resident Pakistanis (NRPs) to the capital market and helping private companies list on the Exchange. Earlier, Shankar, accompanied by Mohsin Nathani, Chief Executive of Standard Chartered Bank (Pakistan) Limited (SCBPL) and senior members of his management team, rang the “Opening Bell” of the KSE in the presence of Chairman KSE Muneer Kamal, MD Nadeem Naqvi, DMD KSE Haroon Askari and directors of the KSE Board. On the occasion Shankar said there was tremendous opportunity for growth in intra-regional trade for the South Asian economies, particularly India and Pakistan. Illustrating India-China bilateral trade, he said when Sino-Indian trade opened up they had to overcome some apprehensions, however, today they were one of the largest trading partners with benefit to both countries. Welcoming the guests, chairman KSE Muneer Kamal said Pakistan’s economy was at an inflection point. Despite challenges posed by low tax-to-GDP ratio, power sector difficulties and current account pressure due to demand slowdown in key export markets, Pakistan at present was in a position to repay IMF loans. The foreign exchange reserves, supported by strong remittances by overseas Pakistanis, were in a much healthier position than at the height of global financial crisis in late 2008. While debt servicing burden had risen, it should be viewed in the global context and Pakistan’s total debt-to-GDP ratio of 64 per cent was far lower than many Euro zone and G-8 economies. A concerted effort to mobilise tax revenue and focus on emerging domestic energy resources such as coal would go a long way in fixing structural deficiencies causing large budget deficits. Kamal highlighted that economic growth can be further accelerated with growing intra-regional trade in the sub-continent. He pointed out that while intra-regional trade in East Asia was 23 per cent of GDP, it was only 1 per cent of the GDP in South Asia. I must say ,it has been oe of the most informative and upto date blog regarding Pakistan economic profile. You have worked hard and the information is correct and precise. ...More detailed metrics of economic activity also show great ‘tranquillity’ in the west (Balochistan & KP). Detailed figures on consumption of electricity by industrial and commercial categories of consumer, for instance, show very little change over the years. But take a closer look and you’ll find something odd. The State Bank has a data series on its website that shows something enormous, of truly gigantic proportions, stirring beneath the tranquillity suggested by the formal macroeconomic data. Here is what the data reveals: the amount of money passing through the clearing houses of Quetta and Peshawar is so large that it rivals the amounts in clearing houses of cities like Faisalabad, Multan and Rawalpindi. First some background. Every time you write a cheque and the other party deposits that cheque in their account, it goes through a process called “clearing”. Because banks don’t hold your money themselves — much of it is held by the State Bank — the task of actually taking the money out of the books of one bank and transferring it to the books of another every time a cheque is cleared, is performed by the State Bank at its clearing house. The State Bank operates 16 clearing houses in cities all over the country. Every month it releases data on how many cheques were presented for clearing in each of these, and what the total amount cleared by cheques was. If you take this data, which stretches back to 1999, and plot it for each city in Pakistan, you notice something very interesting. Remove the cities of Karachi and Lahore from the sample for the time being, because these are global cities in a sense with long-distance connections. Compare only the regional cities and here is what you’ll find. Following 9/11, half the cities in the total sample will show a sharply rising trend in the amount of money going through their clearing houses. For the other half, the line is flat. The cities that show a rising trend are led by Peshawar, with Faisalabad, Multan, Rawalpindi and Quetta in close succession. For Peshawar, the amount of money being cleared via cheque in the year 2011 crosses Rs1.3 trillion! For Quetta, in the same year, the amount is just under Rs900 billion, meaning between them these two regional cities are seeing almost Rs2tr going through their clearing houses in one year alone. This figure compares with Faisalabad at Rs1.3tr, Rawalpindi at Rs1.4tr, and Multan at Rs826bn. Cities that show a flat trend over the entire reporting period include Sukkur, Hyderabad, Sialkot and D.I. Khan. What the data shows is a steep intensification of transactions being cleared by cheque in some cities, and no change in others, meaning the pace of economic activity accelerated unevenly over the decade, sweeping some along its path and leaving others behind. But what are Peshawar and Quetta doing on this list? With Faisalabad and Multan, it’s easy to understand. These are regional hubs, productive centres, large seats of agrarian operations. In fact, after Karachi and Lahore, it is Multan, Faisalabad and Rawalpindi that account for the bulk of transactions in branchless banking, which shows the intensification of activity in the clearing houses of these cities is accompanied by an overall deepening of the financial sector.